SDSC SHAR Recruitment 2018-2019 Apply Online Application Form for 25 Scientist/Engineer ‘SC’ (Chemical Engineering), Scientist/ Engineer ‘SC’ (Industrial Engineering), Scientist/ Engineer ‘SC’ (Industrial Safety) Posts Apply Online through Official website www.sdsc.shar.gov.in. The Interested and Eligible Candidates are requested to apply online through Official website www.sdsc.shar.gov.in. The last date for submission of Online applications is 23.03.2018. 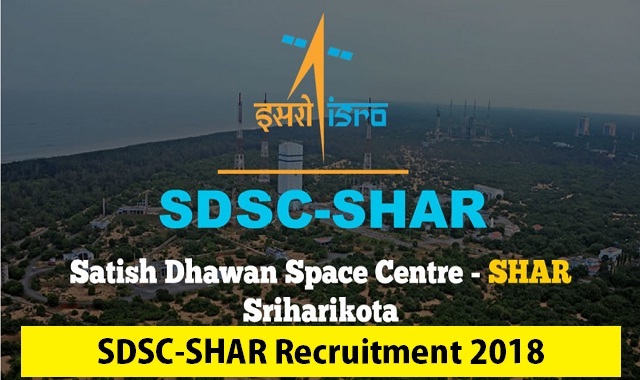 SDSC SHAR Recruitment 2018-25 Scientist/Engineer ‘SC’ Posts - Apply Now. Candidate’s Age Limit Should not exceed (For Post Scientist/ Engineer ‘SC’ & Medical Officer ‘SC - 18 years to 35 years), (For post Medical Officer ‘SD’ - No upper age limit). The Upper age limit is relaxed by 5 years for SC/ST; 3 years for OBC, 10 Years for Persons with Disabilities (15 years for SC/ST PWD’s & 13 years for OBC PWD’s) and for Ex-S as per Govt. of India rules. Candidates Relaxation in Upper Age limit will be provided as per Govt. Rules. Go through SDSC SHAR official Notification 2018 for more reference.